DIS410 Chrome Devil Custom Pro Complete Scooter Professionally Assembled , selling for $279.95 brand new. Manufactured by DropIn Scooters. There are 1 units left brand new. 110 mm DIS Metal Core 1- spoke black wheels with durable high rebound polyurethane. ABEC-11 high speed bearings. Front and Rear wheel Pegs included! Full deck black grip tape with DIS logo. Scooter comes with 2 sets of axles, one for use with pegs and one set for use without pegs. 2 allen wrenches included. The DIS410 Chrome Devil is our newest and lightest complete integrated pro custom scooter. 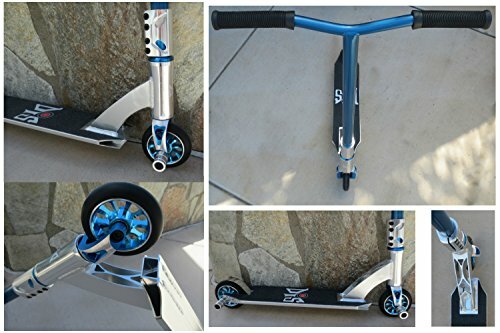 It only weighs 7.9 lbs which makes it one of the lightest 4.5inch wide by 20inch long scooters on the market. Beautifully designed and built for performance. DIS scooters are a great value! Slide the bars in, tighten the clamp and you are ready to ride!